I bought a ticket for the Rugged Maniac with a Groupon. It was only $25 - what a deal! I sent the link to all my friends. I got only one taker! Some people weren't interested, some people were already doing the AZ Urbanathlon that day, and some people just don't like hanging out with me. Then, the one taker canceled his purchase because he remembered he was supposed to do the Urbanathlon. So, no takers. Gr. I guess I was going to be a solo Maniac. Boo. A few days later, I entered a facebook contest (cuz that's what I do) whose prize was an entry to the Urbanathlon... and I won! I figured I would do that race instead of the Rugged Maniac so I wouldn't have to race alone. By the week of the races, none of the people who were supposed to do this race had signed up. What a bunch of slackers. So, now it looked like I was going to be a solo Urbanathlete. Boo. Whatever. I am an independent girl. I don't need no stinkin' friends. I decided to do both races by myself! I arranged my heats in the races so that I could do the Urbanathlon at 9:00 am in Scottsdale and the Rugged Maniac in Buckeye at 1:30 pm. For the record, Scottsdale and Buckeye are about 70 miles apart. The AZ Urbanathlon was a 5K obstacle race put on by Mountainside Fitness. I had very low expectations of them for many reasons. First of all, they put a ton of money into this race. They had commercials, they were partnered with the Diamondbacks and had ads in the stadium. They advertised A LOT. For the money they spent and by being affiliated with a large organization, you would think they would have done a little due diligence with their name, but they didn't. They ended up getting sued by Men's Fitness, who has trademarked the Urbanathlon name. Mountainside Fitness probably has lawyers that could have done a trademark search. Even a quick google search when brainstorming names would have shown that the name was already taken. Stupid. So, they changed the name to AZ Urban Race, and lost $15,000. Second, their website had a whole section about how they were benefitting Make A Wish and how runners could buy pedicab rides to skip the running part of the race and just do the obstacles. . Then, all of a sudden, that section of the website was gone. Huh? Not that I would have done that, but it was unprofessional of them to advertise that part of the event and then take it away with no explanation. Third, the obstacles just looked lame. They were supposed to be things you'd see in a normal urban environment. I'm sure the race's target audience were those people who are too wimpy to take on a Warrior Dash type race, so nothing against them on this one, but for me, it seemed like it would be pretty dull. Overall, I was pleasantly surprised with the race. It was well organized and the location was great. It was at Salt River Fields where the Diamondbacks play for spring training. I was right that the obstacles weren't very exciting, but we did get to run through the stadium. 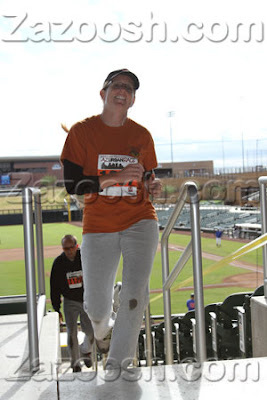 They used the outfield lawn seating areas as running hills and we got to run up and down the stairs of the stadium. That was pretty cool. This is the only picture I took. Well, it was actually taken by a stranger in the parking lot after the race. We jumped that type of barricade as our first obstacle. To show you pictures of the other obstacles, I had to steal the following photos from other blogs on the race. And that was the AZ Urban Race. I'm glad I did it, but I'm also glad it was free! Even though it was a decent event, I don't think I'd pay full price to do it next year. Thanks for sharing, I love those pics. It was a fun, exciting, and a challenging race. Congratulations for a great job well done and looking forward always for more updates.